and make his senior years happy and healthy? Last night I thought I heard my Grandfather's voice, which is weird because he's been dead for years. It wasn't my Grandfather; it was Luc. He sounded just like my Grandpa when he made a grunting noise whenever he stood up. As many of you know, Luc recently turned 10 years old. 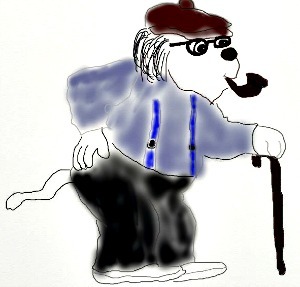 While most of the time I forget that he's a senior because he can have a lot of energy, there are times when I'm aware of his advancing years, like when he does the grandpa grunt. Sometimes now he needs help getting in the car and up on the bed, his stamina isn't what it used to be when we go on long walks, and his stomach isn't made of iron like it was when he was younger. Now I have to cook some of the veggies before he eats it so he can digest it better. Just like with humans, there are some signs of aging that we can prevent with proper care and some signs of aging that need intervention. The key is to pay attention. Noting changes in your Coton can often be difficult because the changes can creep up slowly and may not be noticeable unless you're aware of what to look for. Appetite and weight - is your losing (or gaining) weight? Is there a change in his appetite? Thirst - is your dog drinking more than usual? Energy - is your dog who has always been very active showing signs of lethargy or decreased activity levels? 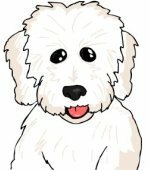 Pain - does your Coton appear to be in any pain? Notice if there's any limping, stiffness, problems chewing, panting, or whimpering. Mental sharpness - Is there a change in how your dog reacts to you? Does he seem disoriented or slow to process things? -Is your calm dog anxious all of a sudden? -Is your housebroken dog having accidents in the house? -Is your active dog now happier being a couch potato? -Is your dog with a voracious appetite suddenly finicky at meal time? 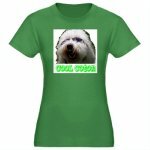 -Does your smart Coton seem disoriented? -Are there other changes such as diarrhea, vomiting, bumps on skin, decreased hearing or vision, or excessive anxiety? Obviously if your dog has serious health conditions, working with your vet to come up with the best plan is essential. Your dog may require medication to treat certain conditions. Most experts consider a small dog like the Coton to be a senior at 7 years old. No matter how old our dogs get, we can make sure that they have the highest quality of life possible. Here are some tips to help your Coton thrive at midlife and beyond. Examine your dog's bedding. If he sleeps with you, is he able to get in and out of the bed easily? Pet stairs or a pet ramp can help. If your dog sleeps in his own bed, is the cushion soft enough? Warm enough? Is there enough room for your dog to stretch out? For years, Luc preferred to sleep on the tile floor no matter how many beds I had for him. But recently he's been sleeping in my bed or on his padded egg crate dog bed. There are all kinds of dog beds to help your senior sleep more comfortably. If your dog has arthritis or joint pain, memory foam or orthopedic beds can help. As your dog ages, regulation of body temperature can become impaired. As a result, they become less tolerant of heat and cold. There are cooling beds and warming beds that can provide relief. When was the last time you changed your dog's food? Obesity in senior dogs can be the catalyst for serious health conditions. Are you giving your dog the same amount of food even though he's less active? Just as with younger dogs, there's no one perfect food that's best for all older dogs. There are hundreds of experts with contradicting advice. So, we have to pay attention - read labels and learn about ingredients, watch how your dog responds to new foods. So much plays into your food choices. Is your dog obese or losing weight? Does your dog have food allergies or food sensitivities? Is your dog active or low energy? Unfortunately, many veterinarians are not the best sources of wisdom when it comes to food. Most dog's metabolic rate slows down as they age and can put on weight if their diet doesn't change. Cutting down on treats and table scraps can help. Or instead of giving scraps of meat, cheese, or biscuits, you can give carrots, celery sticks, apple and cucumber slices, or other veggies that will satisfy their need for crunchy chewy goodness. Luc loves veggies and this makes it so easy for me to provide healthy snacks. There are commercial foods that are developed specifically for the nutritional needs of older dogs. And of course if your dog has health issues such as diabetes or heart disease, it's important to work with your vet to determine the best diet. Whatever food you choose, make sure it's high quality and as always, any dietary changes should be incorporated slowly. Is your dog getting the right amount and the right kind of exercise? We know that exercise can improve your Coton's overall health and well-being, but what kind of exercise is best as your dog ages? Exercise is still important for your senior dog, but you may have to adjust the intensity of his playtime. Long runs and walks may have to be adjusted to shorter less intense walks. Swimming is a good option as well. You may need to replace some of your dog's toys. Some of the tug of war toys may be too hard on an older dog's teeth. If your dog used to run after a ball or Frisbee, that may be too strenuous and hard on his joints. If your older dog loves the Kong like Luc does, there's a Kong Senior that's easier on your older dog's teeth and jaws. Does your dog limp or have difficulty going up and down stairs? Does he sound like Luc or my Grandpa when he stands up? Your vet can determine if your dog has arthritis by taking X-Rays. The sooner your get a diagnosis, the more chance of slowing down the progression of symptoms. There are all kinds of solutions that can help your dog feel better. Some dogs have success with massage, hydrotherapy, medication, losing weight, acupuncture, whirlpools, supplements and herbs. According to The Whole Dog Journal, certain foods such as papaya, celery, alfalfa, mango, and ginger have proven helpful in alleviating arthritis symptoms. Dental care is even more important as your dog gets older. Watch for signs of broken or loose teeth, sudden bad breath, drooling, and difficulty chewing. Teeth cleaning can reduce the chances of heart, lung, and kidney disease. It's such a simple thing that can prolong the life of your dog. Do you have a good relationship with your veterinarian? This is especially important as your dog ages and may need more medical attention. I used to go to a large practice where we rarely saw the same vet twice and each doctor gave conflicting advice. Now Luc goes to a small family vet and sees the same doctor all the time. The vet knows Luc's history and he gets consistency in care. Trust is an important factor in finding a good vet and it's also a plus if you find someone who is familiar with this rare breed. -Raised Dog Food Bowls make it easier for dogs with stiff joints. -A Dog sling carrier is great for dogs with limited stamina or mobility. The important thing to remember is that no one is more qualified than you to determine if your dog is experiencing changes as he ages. There's a lot of advice floating around and what's best for one dog may not be best for another. I love when Luc still acts crazy like a puppy and I love him when he's acting like a crotchety old man. I just want him to be healthy and happy no matter what stage of life he's in. I know you want the same for your dog as well. You can learn more about senior dog care here. It's almost Valentines day and Luc and I are wishing you lots of LOVE. 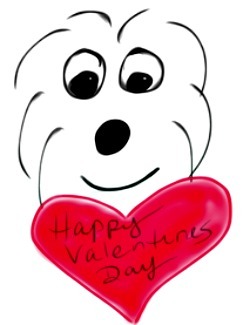 Every day is like Valentines Day when you have a Coton, right? Did you know the word for love in Malagasy is Fitiavana?